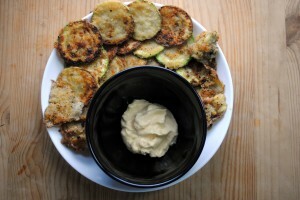 I can’t explain it, but I suddenly had a craving for fried vegetable fritters with homemade mayonnaise as a dipping sauce. I was skipping Hebrew and I guess felt like making it worthwhile. It was an incredibly specific desire, and I could even taste the exact ratio of mellow creaminess to bright lemon in the mayonnaise. 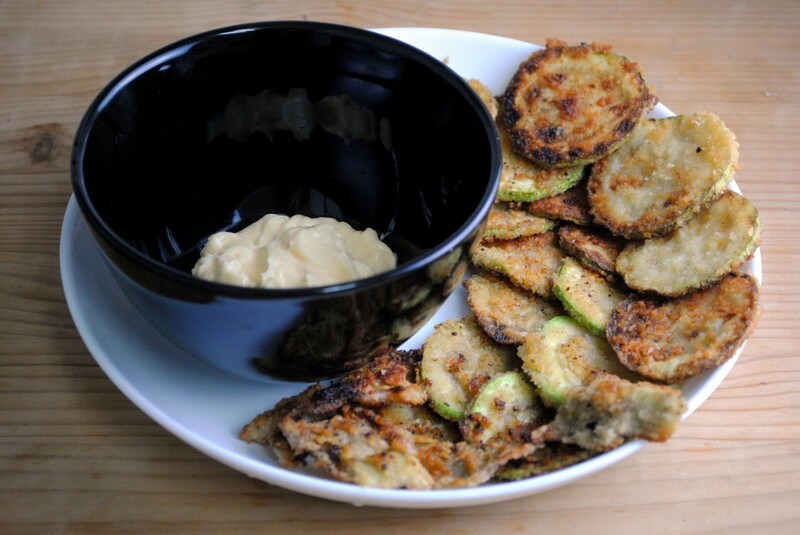 Lucky for me I had all the ingredients on hand – egg, oil, lemon, breadcrumbs, zucchini, leftover artichoke. Before breading the vegetables I whisked a little seltzer into the egg, which made the batter nice and light. 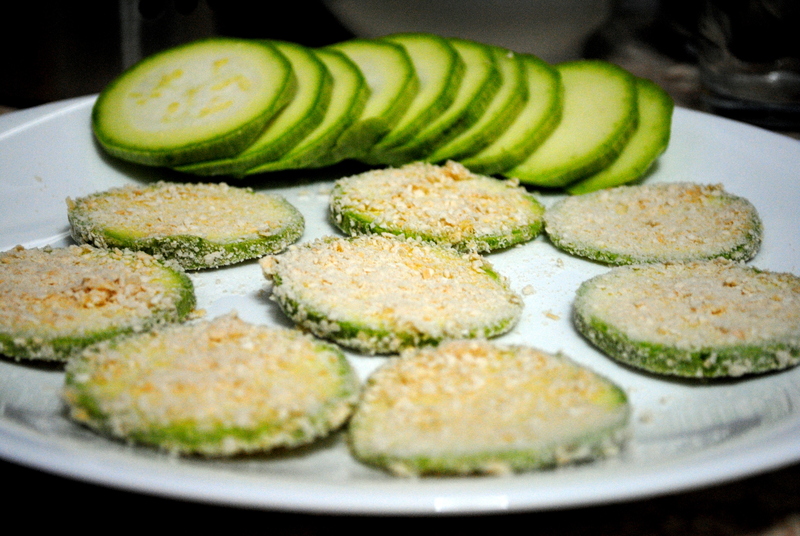 Use any thinly sliced vegetables you have on hand and serve this as a starter or snack. Then use the leftover mayonnaise to slather on sandwiches or dip fries into. If you’ve never made mayonnaise before, never fear. All you need is a whisk (my electric whisk made the job even easier) and within minutes the egg yolk and mustard emulsifies and looks like mayonnaise (there are recipes without mustard too, and just egg and oil will create this alchemy of food). Although I always thought mayonnaise called for olive oil, the recipes I found firmly said to use a neutral oil. I started out with corn oil but found the flavor I was looking for lacking. Turns out I like a little taste of olive oil in my mayo. Not all recipes call for lemon, either, but I like a lemony mayonnaise. Trust your own palate and taste as you go. 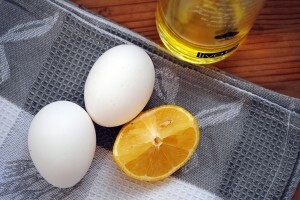 Put the egg yolk and mustard in a bowl with a pinch of salt and pepper and a dash of vinegar. Using an electric mixer, an old fashioned whisk, or an electric whisk (my weapon of choice), beat vigorously until the contents are fully combined and slightly thickened. While whisking, add begin to add the oil in a slow stream. Stop adding oil but continue whisking, until the mixture emulsifies and looks like mayonnaise. Continue adding oil in a slow stream and whisking until the mayonnaise reaches the desired consistency (which may be less than a cup of oil). Whisk in lemon juice to taste (I like a slightly lemony mayo) and season with salt and pepper as necessary (Robuchon suggests dissolving salt in a teaspoon of vinegar and adding that to the mixture, which will allow the salt to be absorbed). Store in a clean glass jar or covered with plastic wrap in the back of the fridge for up to four days. Whisk the egg in a bowl with the seltzer. Put the breadcrumbs in another bowl. Dip a sliced vegetable in the egg then the breadcrumbs. Repeat with the remaining vegetables. Heat oil in a large skillet and add the vegetables so they are in one layer; work in batches if necessary and don’t crowd the pan. Flip once and cook until the fritters are slightly browned on each side. Transfer to a paper towel-lined plate as they finish. 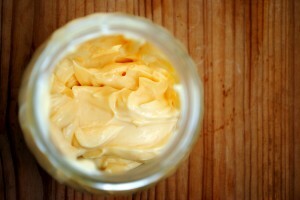 Serve immediately with homemade mayonnaise (recipe above).